Lt. Cmdr. 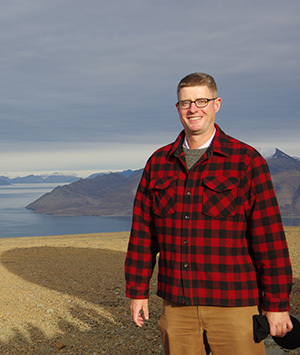 Sam Greenaway at the Arctic Regional Hydrographic Commission meeting in Svalbard, Norway. I’m Lt. Cmdr. Sam Greenaway, currently the chief of the Hydrographic Systems and Technology Branch (HSTB). I am wrapping up my stint here at Coast Survey headquarters and will be heading back out to sea next month as executive officer of NOAA Ship Fairweather. Rear Adm. Smith kindly asked me to put in a quick note for this newsletter. We are knee deep in a bunch of cool projects here in HSTB. The good news is, all the work has been done by the team here, and so I fully expect things to keep humming along until Lt. Damian Manda arrives to take over the helm in a few months. Lt. Manda is currently the operations officer on Fairweather and is just the right kind of person for this shop – he will do great. A few projects of note: our optionally unmanned launch conversion project is a few weeks from operational delivery. In test runs so far, the launch has driven a survey line, though like a human boat driver as the first few lines were snaky-waked mess! This, along with the data-radios installed on NOAA Ship Thomas Jefferson (7 Mbit/s at 5 miles!) are key parts of Coast Survey’s unmanned systems strategy. Also, in the robot realm, we just took delivery of a few small quadcopters (don’t tell anyone, but Matt Sharr was flying them around the lab yesterday), and are planning an operational deployment off Thomas Jefferson next month. We have been working closely with National Geodetic Survey's Remote Sensing Division and NOAA Aircraft Operations Center to figure out the administrative hurdles as well as the technical ones for these small, unmanned aerial systems (sUAS). I’m confident we will have a clearly defined path to using this technology very soon. My hunch is sUAS coupled with structure-from-motion processing is the right answer for the near-shore verification mission. I think we have made huge strides with automating the data processing workflow, and I am keen to see the fruition of some machine-learning projects for some of the more routine data processing tasks. I just got back from briefing NOAA’s Center for Operational Oceanographic Products and Services (CO-OPS) folks on how we have fully transitioned to surveying on the ellipse, which has been a tremendous success for the whole organization. I am particularly impressed with the operational datum support that HSTB has been able to spin up (need a grid of the WGS-84 to Mississippi River datum separation? We can do that.). The collection and processing of acoustic backscatter is moving in the right direction; the inter-system normalization efforts put out in the field this year builds on over a decade of work and significantly improves our products. While we have streamlined some of the documentation, I suspect we have stacks of work to do to streamline and automate the ancillary analysis and products as well as our main survey deliverables. The rise of the robots is going to increase data volumes; we need to befriend the robots to do some of the documentation, analysis, and processing as well. I’m convinced the right way to do this is in collaboration and partnership with other hydrographic offices and users, and the public release of the full Pydro universe (yes, you can now use Pydro at home!) is a big step in this direction. It has been a real treat to work here in HSTB, there are perhaps few places better suited for a deep dive into hydrography than HSTB, so it has been a real honor to work with all the folks here in the branch, across Coast Survey, and with all our esteemed collaborators. surveys the Cape Fear River following Hurricane Florence. While conducting hydrographic surveys at the request of the U.S. Coast Guard following Hurricane Florence, Coast Survey’s navigation response teams and NOAA Ship Ferdinand R. Hassler with Coast Survey physical scientist staff onboard, found many underwater obstructions. Four obstructions in particular, found in the Cape Fear River channel, were identified as dangers to navigation. While these hazards remained in place when the port reopened, NOAA updated its charts and distributed them to the port, Coast Guard, and key stakeholders, allowing large vessels to safely navigate into port. The time from the survey to the publication of the chart was less than 24 hours, an unprecedented accomplishment for Coast Survey. Visit our blog for the full story. For more information contact James.M.Crocker@noaa.gov or Mike.Brown@noaa.gov. surge projections on September 13, 2018. 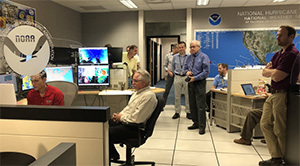 The Coast Survey Development Lab provided storm surge modeling expertise to the National Hurricane Center in Miami, Florida, ahead of and following Hurricane Florence. Dr. Sergey V. Vinogradov, storm surge modeling lead, provided visualizations of storm surge simulations using the Hurricane Surge On-demand Forecast System for each forecast cycle of Hurricane Florence. Hindcast simulations were performed following the storm, to validate the model performance. This work contributed to storm surge predictions and inundation information, ultimately supporting public safety. For more information contact Sergey.Vinogradov@noaa.gov. 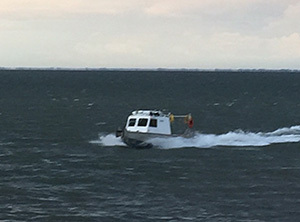 first of three 24-hour sea-trials. 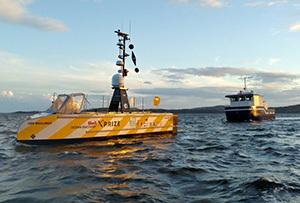 The GEBCO-Nippon Foundation Alumni Team successfully completed its first 24-hour sea-trials in preparation for the final round of the Shell Ocean Discovery XPRIZE. The team, including 15 alumni of the GEBCO-Nippon Foundation postgraduate training program based at the Center for Coastal and Ocean Mapping (CCOM), University of New Hampshire, is led by Dr. Rochelle Wigley, CCOM’s GEBCO project director. The purpose of the sea trials is to assess various operating procedures and fine-tune its entry before the final round in November-December at a secret location yet to be announced by the Shell Ocean Discovery XPRIZE. The $7 million XPRIZE is a global competition challenging teams to advance deep-sea technologies for autonomous, fast, high-resolution ocean exploration. For more information contact Andy.Armstrong@noaa.gov. At the request of the Columbia River pilots, NOAA’s navigation response team stationed in Seattle has been surveying 14 Columbia River Anchorages since June 2018. Lt. j.g. 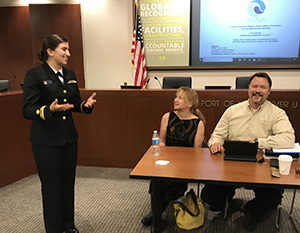 Michelle Levano, response team lead, traveled to Vancouver, Washington, to present survey progress to date, preliminary results, and future plans at the Lower Columbia Region Harbor Safety Committee meeting. Eight of the 14 anchorage areas have been completed, with the remaining to be completed this fall. Meeting attendants were particularly interested in potential shoaling areas within the river, and any new dangers to navigation that were located. This data will help determine the size and number of vessels that the river can maintain at a time. In the future, the river will support more cruise ships, Coast Guard vessels, and larger merchant ships than it has historically experienced. The team’s data from the Columbia River survey will help CO-OPS determine future placement of benthic current meters and new tide gauge locations throughout the river. For more information contact Michelle.Levano@noaa.gov. meet in Longyearbyen at Svalbard, Norway. Rear Adm. Shepard Smith, Lt. Cmdr. 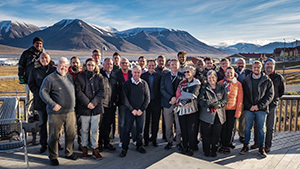 Sam Greenaway, and Jonathan Justi attended the Eighth Conference of the Arctic Regional Hydrographic Commission in Longyearbyen at Svalbard, Norway, to coordinate hydrographic activity among member states—Canada, Denmark, Norway, Russia, and the United States—in the Arctic region. The meeting focused on international charting considerations, crowdsource bathymetry, autonomous systems, and marine spatial data infrastructure and policy. The International Hydrographic Organization (IHO) encourages the establishment of Regional Hydrographic Commissions (RHCs) to coordinate hydrographic activity at the regional level. The RHCs are made up of IHO member states and other regional states that meet at regular intervals to discuss the resolution of mutual hydrographic and chart production problems, plan joint survey operations, and resolve schemes for medium- and large-scale international chart coverage. For more information contact Jonathan.Justi@noaa.gov. sonar data acquisition on the small survey vessel C-Wolf. Hydrographic Surveys Division Operations Branch physical scientists, Meredith Payne and Starla Robinson teamed up with western Gulf coast navigation manager, Tim Osborn, to visit contractor, Oceaneering International Inc., on the site of the Approaches to Tampa Bay, Florida, hydrographic survey project. 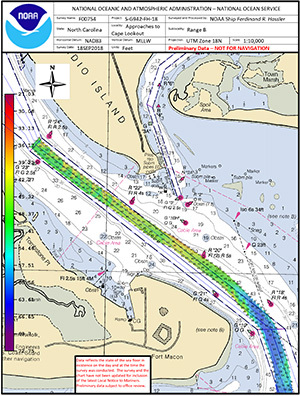 Data acquired in the 660 square nautical mile project area will serve the interests of local pilots, recreational mariners, coastal managers, and habitat conservationists, as well as providing much-needed updates to nautical charts. Meredith and Starla discussed details of survey operations with the Oceaneering field crew and also participated in side scan sonar data acquisition on the small survey vessel C-Wolf. Tim Osborn, a native of the Tampa Bay region, acquainted Oceaneering managers with St. Petersburg and related the importance and impact of the survey area to the Florida economy and its residents. The Ports of Tampa Bay supply over 40% of the fuel arriving in Florida, which is currently the second fastest-growing state in the U.S. With the exception of Egmont Channel, the majority of chart data for this region dates back to the twentieth-century or older. Additionally, this area is particularly vulnerable to large storm events--four have struck the region in the past three years. All of these factors add up to making this a crucial location for modern survey data. For more information contact Meredith.Payne@noaa.gov. to Wilmington following Hurricane Florence. On September 10, NOAA Ship Ferdinand R. Hassler broke from their hydrographic survey of the Approaches to Jacksonville and transited from offshore of Amelia Island to Charleston, South Carolina, to prepare for Hurricane Florence and stage for recovery response. 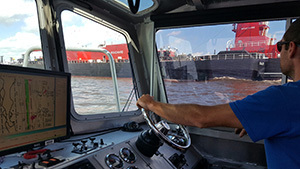 Immediately after the storm’s passage, the ship departed to assist in the recovery effort, surveying shipping channels in Charleston, South Carolina, and the North Carolina entrance channels to Wilmington, Morehead City, and Wrightsville. Of the Hurricane Florence responding fleet, Hassler has the greatest endurance for time deployed at sea; and can withstand the greatest sea state with an operational limit of 8 feet. This makes Hassler an ideal responder for open waters, such as port entry channels. Hassler is commanded by Lt. Cmdr. Matt Jaskoski and is one of only four NOAA ships that is capable and ready to respond to emergency hydrographic surveys. Coast Survey physical scientists Starla Robinson and John Doroba were on board during the response period assisting with survey and data processing efforts. For more information contact Starla.Robinson@noaa.gov. NRT 1 - Cleaning and repacking systems post-Hurricane Florence and traveling to the Department of Commerce Gold Honors Ceremony. NRT 2 - Processing data post-Hurricane Florence and preparing for surveying in Florida. NRT 3 - Deployed to Marine Operations Center - Pacific to help with autonomous launch conversion. NRT 4 - Preparing for survey in Houston/Galveston area and Flower Gardens Banks National Marine Sanctuary. NRT 5 - Processing data post-Hurricane Florence, getting ready for routine surveying. Bay Hydro II - Surveying Delaware Bay. Rapidly rising rivers and unprecedented rainfall amounts that came with Hurricane Florence posed significant safety and logistical challenges throughout Coast Survey’s response efforts. On the morning of September 16, NRT 2 safely made their way into Wilmington, North Carolina, just hours before the city was completely cut off from the rest of the state by rising flood waters. NRT 5 made their push into Morehead City, monitoring road closures and coordinating closely with U.S. Coast Guard units that had successfully made it into Morehead City earlier that morning. Coast Survey’s Navigation Response Branch (NRB) headquarters continually monitored river levels and flow predictions for North Carolina rivers using information from the NOAA Advanced Hydrologic Prediction Service and monitored North Carolina Department of Transportation road closures website to help route teams to their destinations. Thank you to our teams that responded including NRT2: James Kirkpatrick (team lead), Lucas Blass, Howie Meyers, and Doug Wood; NRT 5: Lt. j.g. Dylan Kosten (team lead), Eli Smith, Michael Bloom; NRT 1/MIST: Joshua Bergeron, Alex Ligon, Mike Annis (MIST lead). For more information contact Michael.Davidson@noaa.gov. 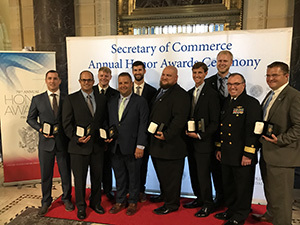 On Tuesday, September 25, Department of Commerce Gold Honors Awardees received their medals at a ceremony in Washington, DC. Congratulations Kyle Ward, Mike Annis, John Doroba, Michael Bloom, Jonathan French, Eli Smith, and Josh Bergeron for their outstanding dedication, expertise, and professionalism while volunteering at short notice and under challenging conditions to form the Mobile Integrated Survey Team during the aftermath of hurricanes Harvey, Irma, and Maria. Cmdr. Chris van Westendorp, commanding office of NOAA Ship Thomas Jefferson, also attended the ceremony accepting the medal on behalf of the ship in recognition of their exemplary hurricane response to Puerto Rico. April 1862, the Army of the Potomac discovered Confederate defensive works behind the Warwick River along the Peninsula at Yorktown. Assistance from the Coast Survey was called upon to help conduct surveys of the surrounding area. 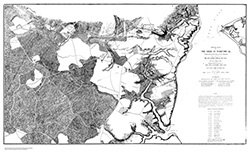 These surveys laid the groundwork to create a plan for a siege of Yorktown. 10/4 - NOAA Industry Day at the Annapolis Yacht Club, 8 a.m. - 3 p.m.
NEW reporting mechanism for GIS Service/Server outages: If you find issues affecting ArcGIS-based applications and services please submit an OCS Help Desk Ticket with the subject line "URGENT - GIS Server Issue." This will allow the issue to be properly addressed in a timely manner. Having problems with ArcGIS Software (crashes, errors, etc.)? Don’t forget the NOAA Esri Central Support (NECS) is here to help. It’s all about the Data! OCS GIS Portal and NOAA Geoplatform. Curious about ArcGIS Pro? Check out the ArcGIS Pro Introduction Page. Check out the NOAA GIS Community page for information on GIS projects, software, and geospatial initiatives. Esri released Desktop 10.6 and Pro 2.1. Click here for Esri installation Files.